A title page explaining the purpose, conventions, and symbols of the drawing. These are usually unscaled, with landscape orientation. A few pages of floor plan layouts showing equipment locations, wiring paths, lighting, and other technical details. These are usually scaled, with landscape orientation. Several pages of detailed drawings showing elevation views of rack-mounted equipment and other gadgetry. These scaled drawings usually have portrait orientation. All pages in the drawing that require a common frame, title, title block, and company logo. These details are often on a single background page shared by the rest of the document. Visio can handle printing such a document, but you should take extra care to inspect each page in Print Preview and double-check your Page Setup settings. If you have mixed landscape and portrait page orientations across pages, be sure that the Print Setup and Page Size settings for orientation agree for each page. The Page Setup dialog has preview areas for both of these tabs that make it obvious when orientations differ, and you receive a last-chance warning just before printing if orientations don’t match. After you’ve verified that the printer paper is the same for all pages and orientations match, you can decide how to print each page to that paper. If all your pages have the same size, you don’t need to worry about this. Otherwise, turn your attention to the Print Zoom setting and choose Adjust to 100% (or other zoom) or tile the drawing using Fit to X Sheets Across by Y Sheets Down. Turning on AutoSize from the Design tab. 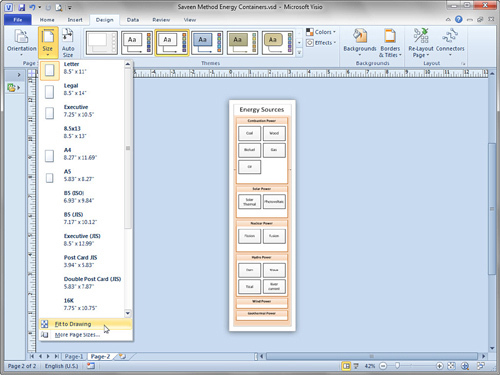 Visio automatically adds and removes full page tiles as the diagram grows or shrinks. Clicking the Size drop-down on the Design tab and choosing Fit to Drawing at the bottom of the list. The page contracts or expands to tightly enclose all details. Manually resizing the page by holding Ctrl while dragging an edge of the page. When it’s time to print, he uses only the Print Setup tab in the Page Setup dialog. There, he chooses a paper size that matches his target printer and sets the Print Zoom to Fit to 1 Page Across by 1 Page Down. He can send his output to a normal office laser printer for personal use or to a large-format plotter to create a poster for his next meeting. Figures 4, 5, and 6 illustrate this process for a very tall drawing. Figure 4. 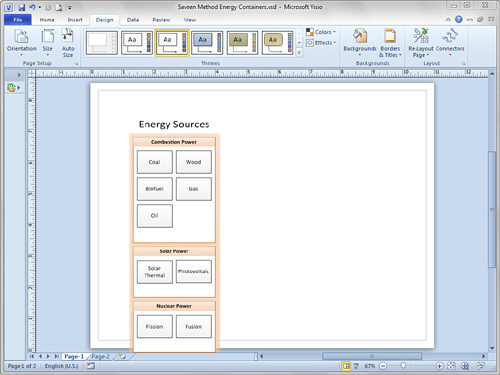 The Energy Sources diagram has been rearranged to a very tall format and doesn’t fit on the page any more. Figure 5. A quick visit to the Design tab and click of Size, Fit to Drawing expands the page to tightly enclose the content. Figure 6. In Print Preview, the Page Setup dialog is used to print the page to legal-sized paper. 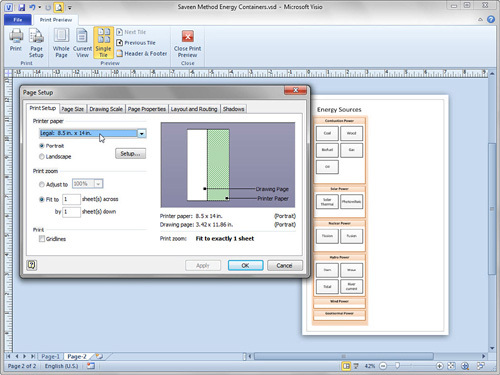 Print Zoom is set to 1 Sheet Across by 1 Sheet Down, and Visio scales the drawing to fit the paper. I call this method of working the “Saveen method,” but you might call it the “Don’t worry about page size” method. If the actual, physical size of your printed document isn’t important, and you don’t have style requirements or corporate standards for page sizes, borders, and title blocks, this is a great way to work.